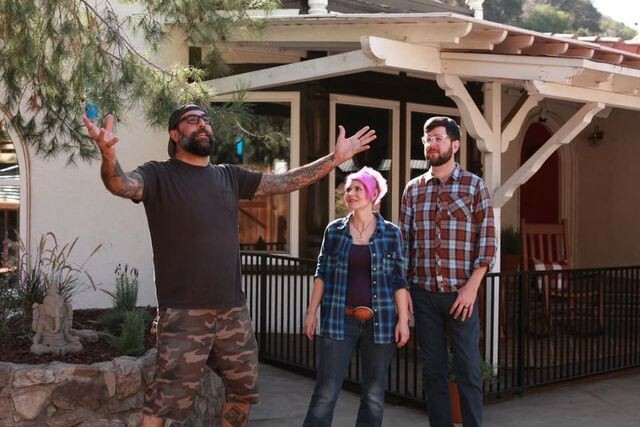 Now in its second season, “Animal Cribs” follows Ballatore as he builds a variety of animal accommodations, including a den for dragons (of the bearded variety) and a bedroom for horses (so they wouldn’t demand to sleep in their owner’s bedroom—long story). 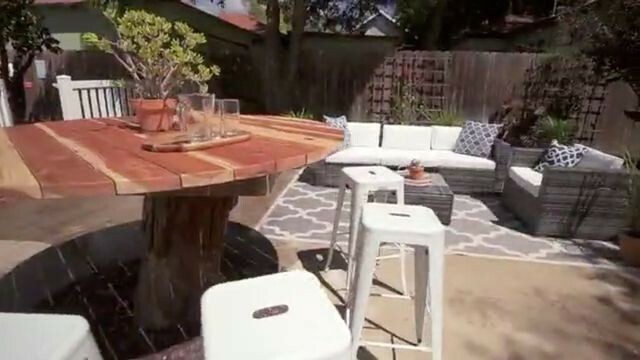 Each week, Ballatore works with a sharp team of “catsperts” and “barkitects” to transform drab, cramped homes and yards into functional, high-style spaces for both pets and the humans who love them. He took his English bulldog, Chewie, along with him on all of his design projects, and clearly adored creating spaces for the owners’ pets. So it wasn’t that much of a stretch when the producers of “Animal Cribs” approached him to be their host and designer, too. On “Animal Cribs,” Ballatore aims to create harmony among the species in their own special living spaces—without breaking the bank. Antonio Ballatore discusses plans to get this 200-pound python out of the kitchen. Ballatore recently took time out of his busy building schedule to give realtor.com some tips on creating more harmonious habitats for your own furry/feathered/scaly friends. 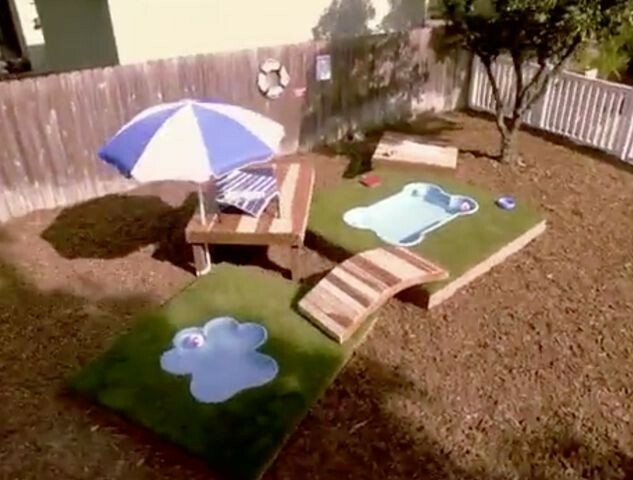 Even if you’re not creating an entire “Dawg Town” or “Python Playground,” as he’s done in the past, you’ll be able to pick up some slick suggestions to create your own pet paradise—for any shape, size, or species. Ballatore believes that pets are members of the family, and that “people should consider the best way for everyone to live so they can enjoy life together, while you’re there,” rather than be concerned about pleasing some unknown buyer down the road. “I love tapping into the family, how they live, what fits their lifestyle best,” says Ballatore. He thinks the best animal spaces are ones where both humans and pets can be comfortable together. 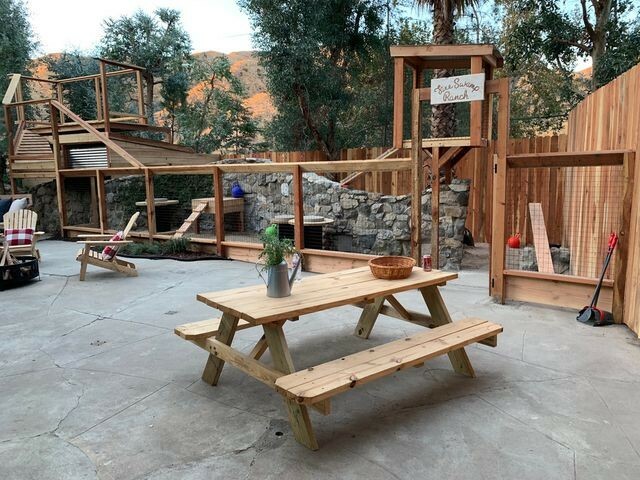 So in one dry, dusty backyard, he not only created diversions for the dogs, but he also made a nice conversation area where folks can sit and watch the dogs at play. “It’s about bringing the entire family together, not just having the dog outside. Everybody’s together, everybody’s safe, everybody’s chilling,” he adds. But dogs aren’t the only pets this applies to. 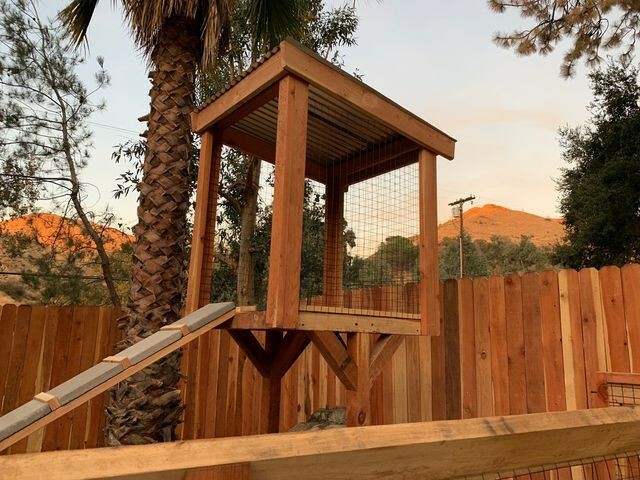 For goats, he’s created a tall tower with a ramp, so the adorable critters could see and be seen (they are indeed curious creatures). 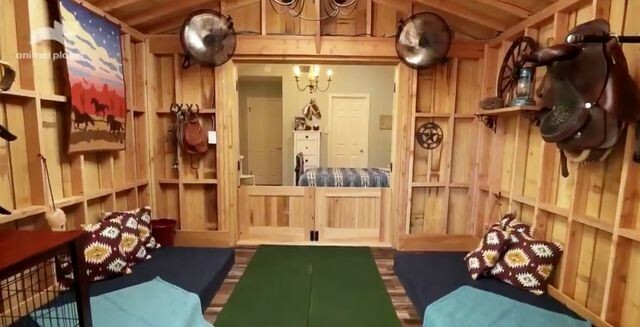 Even for snakes, instead of converting an entire large basement into a python paradise, he reserved one room for a stylish bedroom for one of the owner’s teenage sons, so he and his brother wouldn’t have to share a room with bunk beds anymore. “People and animals are the same in that they need their own space,” he says. The spaces he creates are always varied and intriguing, both for humans and animals. This goat area provides plenty of varied experiences for the critters. For example, a surface that works best for dog runs might make a tasty but toxic treat for goats. 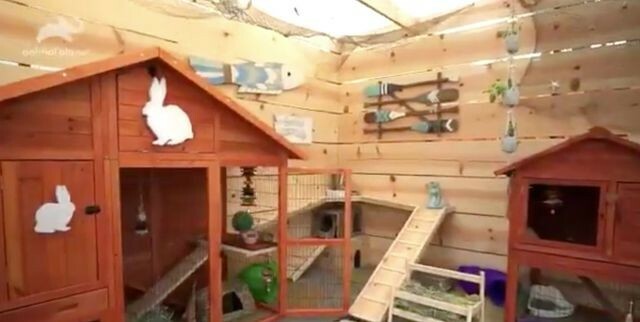 For example, he says, they had to use special kiln-dried pine wood for a chinchilla enclosure, because some woods can be poisonous to the little guys. “Do the same type of research you’d do for a baby nursery,” he advises. You don’t have to create a big, fancy pet palace to keep your animals happy, but you do have to keep them in a safe enclosure where they can’t get out and wander into traffic. It should also be safe from predators. “The first thing to do is mend all fences,” Ballatore says, adding that animals also need to be kept safe from the elements and extreme temperatures. “Almost all animals love water features,” says Ballatore. But water can get stagnant and filled with algae if the wading pool or watering trough is not easy to drain. “Make sure there’s a drain and a place for the water to empty,” Ballatore advises. Then there are the caves and small spaces where animals like to burrow, which may be hard to reach to clean. Ballatore cleverly designed a series of doghouses so the tops came off and the owners could reach down inside to clean them, rather than having to attempt to shimmy inside. These pup pools are easy to clean because they’re above ground and have drains. There are very few species that don’t like some variation in their topography. Dogs, cats, goats, snakes, lizards, and birds all like to perch or climb or crawl up and down. Goats, in particular, like to climb to the highest surface, which is why goat yoga, during which these nimble critters climb atop of you, works so well. In fact, “no one, not even humans, likes to be down on the ground all the time,” says Ballatore, who advises installing ramps, steps, raised beds, and other diverse surfaces in all of your animal areas. 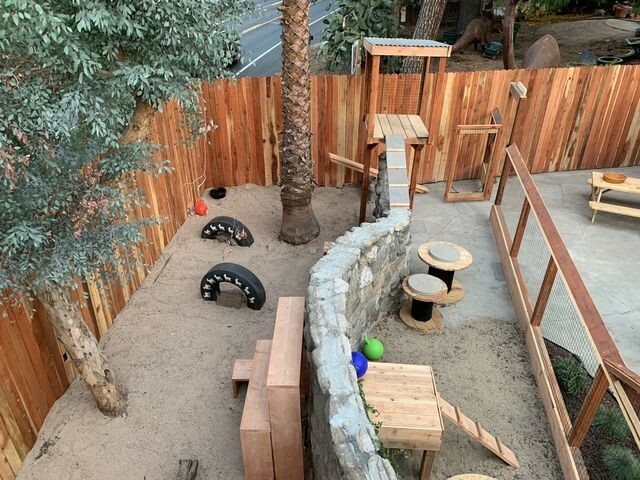 Multiple levels, surfaces, and textures keep both humans and animals occupied. Ever notice how on hot days, your dog gravitates toward cool tile, shaded cement, or slick marble, while on cold days it likes to curl up on soft beds that retain body heat? There are other textures that are important as well. Most species like to scratch their backs against something rough on occasion, whether it’s rolling on the grass, rubbing against a fence, or even wrapping themselves around a branch with rough bark. Dog owners are well aware that it’s difficult to keep lawns looking lovely when Fido is not only constantly digging them up, but also using them as a toilet. And every dog owner is well aware of the consequences of mud and dust being trailed into the house because the lawn has been reduced to a giant dirt patch. 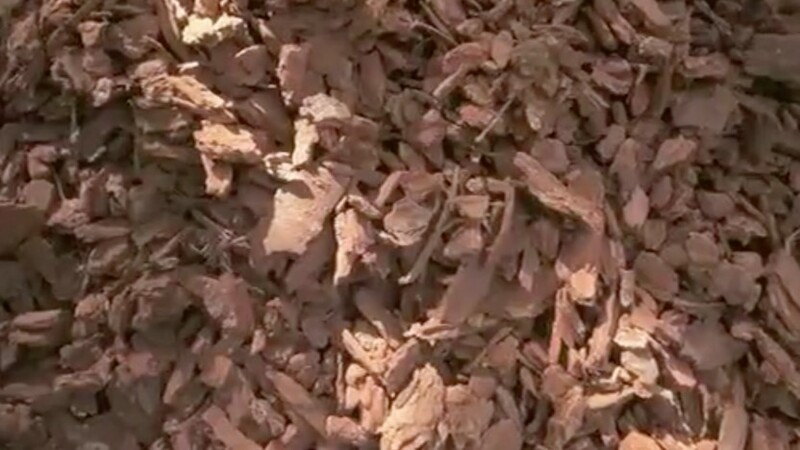 Ballatore’s answer to this situation is simple: mulch—but not just any old mulch. Mulch makes a great surface for dogs. “Animal Cribs” airs on Fridays at 9 p.m. on the Animal Planet channel.